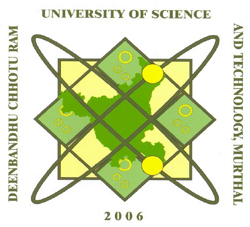 Deenbandhu Chhotu Ram University of Science and Technology (DCRUST), formerly known as Chhotu Ram State College of Engineering, Murthal (CRSCE) started in 1987 is a government university in the State of Haryana. Deenbandhu Chhotu Ram University of Science & Technology, Murthal came into being on 6th November 2006 by upgrading erstwhile Chhotu Ram State College of Engineering, Murthal through an Act 29 of 2006 of the Legislature of the state of Haryana with the vision to facilitate and promote studies and research in emerging areas of higher education with focus on new frontiers of science, engineering, technology, architecture and management studies, humanities, and also to achieve excellence in these and connected fields. The University has been considered eligible for grants under Section 12(B) of UGC Act, 1956 in March, 2009. The University has got affiliating status and the technical and professional College/Institutes located in the District Sonepat have been affiliated to the University. Six B.Tech programmes of the University have also been accredited by National Board of Accreditation (NBA). University has a Central Instrumentation Laboratory available to scholars who belong to different depts or outside institute as central research facility.